Apple Day is mainly celebrated in the United Kingdom, where it was started. Common Ground, a group dedicated to building strong communities, strengthening local distinctiveness, and connecting people with nature and each other, held the first Apple Day in 1990, at Covent Garden in London, England. Their goal was to create an autumn holiday that would not only be celebrated in London, but also in other cities, villages, parishes, markets, and even orchards. They wanted to demonstrate the richness and diversity of apples, but also the diversity of landscape, ecology, and culture as a whole. Many different activities have taken place on the day. First and foremost has been the buying, tasting, and eating of apples. Other activities have included juicing, pruning, grafting, and identifying apples, and games, songs, and poetry about apples. In England, many groups such as museums, shops, restaurants, horticultural societies, Wildlife Trusts, National Trust properties, and schools organize activities for the day. By the second year of Apple Day, there were over 60 events. There were over 300 events in 1997, and 600 by the new millennium. Not all “apple days” are held on October 21. Some groups hold these celebrations on other days of the month. Through the day’s success, it has not only demonstrated the importance of the apple but the importance of local celebrations as well. The day has germinated local pride and grown interest in local distinctiveness. Apple Day has also led to an interest in raising awareness for the origins of food and to encouraging healthy eating. The apple tree is a deciduous tree from the rose family and is cultivated around the world as a fruit tree. It originated in Central Asia; its ancestor is the malus sieversii, which still grows today. Apple trees grew for thousands of years in Asia, as well as in Europe—the starting place of Apple Day—before being brought to North America by European colonists in the seventeenth century. They are possibly the oldest tree to have been cultivated. The only apples native to North America are crab apples. Reverend William Braxton of Boston planted the first apple orchard on the North American continent in 1625. Apples were cultivated on colonial farms and spread along Native American trade routes. Johnny Appleseed introduced apple trees to the western frontier. Today apple trees are prominent in Eastern Washington, where apples are their leading product, and more apples are grown there than any other state. If grown by seed in the wild, an apple tree can tower up to 30 feet, but they are generally 6-15 feet in height when cultivated. The height of the cultivars depends on how they were grafted onto rootstocks. There are over 7,500 cultivars of apples, which are grown for various purposes such as eating raw, cooking, and cider making. Apple tree flowers blossom in the spring, and the leaves bud at this time as well. Flowers cluster in groups of four to six and the center flower is called the “king bloom.” It opens first and can grow into larger fruit than the other flowers. The fruit is ready to pick by late summer or fall. 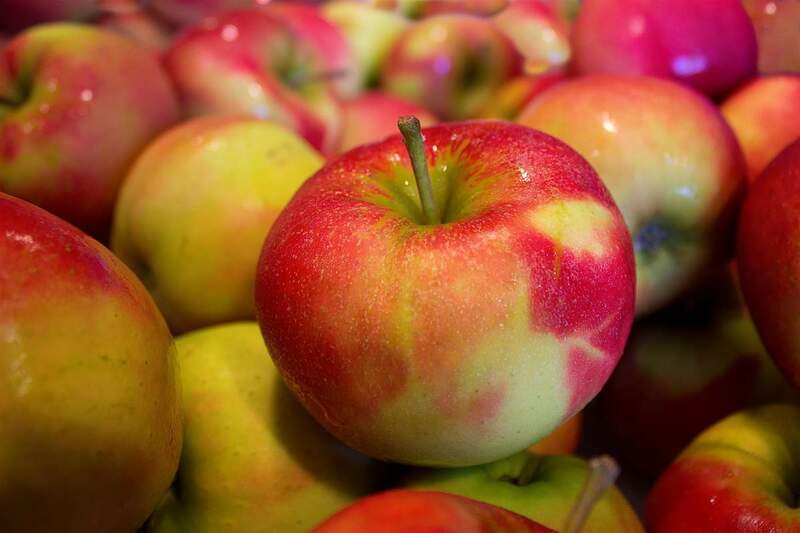 Apple Day is being observed today! It has been observed annually on October 21st since 1990.